p> Whether you're going camping or to an overnight party, your 14-inch doll will be prepared with this groovy, blue, pink, green, and white geometric-flowered sleeping bag set. This ultra-comfy bedding set includes a thick, colorful flower-print fabric sleeping bag with teal-blue plush on the inside. The best part is that the awesome sleeping bag is reversible for extra bedtime fun! 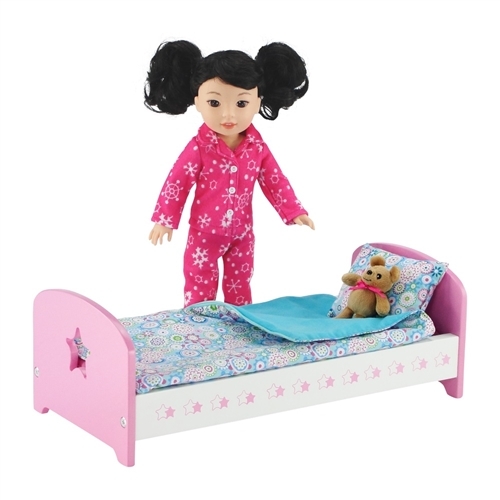 Your American Girl doll's head will rest on a matching, flowered pillow, and she will sleep like the princess she is. This fluffy, unique set packs easily into its matching carrying case. Snuggle up and stay warm tonight with this essential overnight accessory! Ultra-cool, multicolored geometric flower print sleeping bag set, perfect for sleepovers! Groovy and fun, includes reversible plush sleeping bag, thick matching pillow and drawstring carry case. 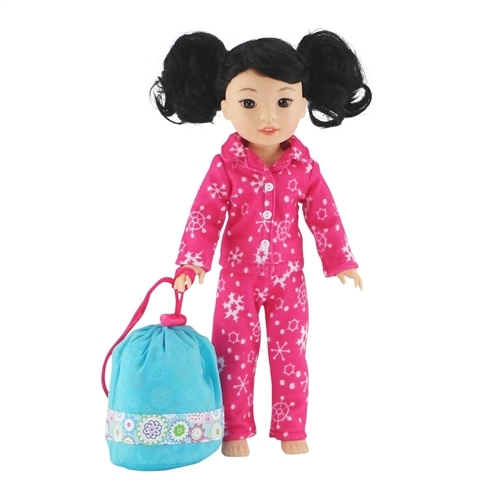 Doll sleeping bag made to fit 14-inch dolls such as American Girl Wellie Wishers ®, Heart For Hearts Girls, and other similarly sized dolls.